Bad breath is often caused by gum disease, also known as periodontal disease. In gum disease, the tissues that surround the teeth become infected. Gum disease occurs just below the gum line by causing the inflammation and breakdown of the tooth’s attachment site and its supporting tissues. Although gum disease is a chief cause of bad breath, it is generally treatable by an oral-healthcare professional. There are two forms of gum disease. Gingivitis is a form of gum disease that affects only the gums, the soft tissue surrounding your teeth. Periodontitis is the more severe form of gum disease. In periodontitis, infection spreads to below the gums to damage other types of surrounding tissue and the bones that support the teeth. Gum disease is often the result of plaque build-up in the mouth. 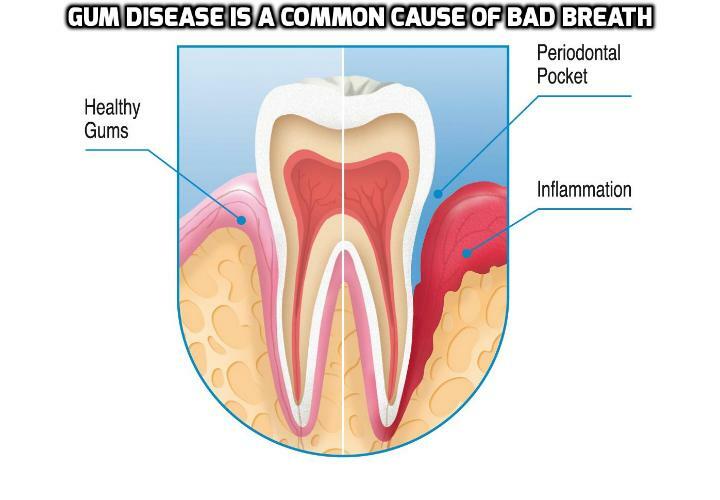 The plaque build-up that causes gum disease and the accompanying bad breath is generally due to poor oral hygiene, smoking, impaired immune function, and medical conditions such as diabetes. Bacteria cause the formation of oral toxins, which irritate the gums. If gum disease continues to progress without treatment, you can experience substantial damage to your jawbone and gums. As bacterial plaque begins to accumulate in the mouth, the bacteria reacts with residual sugary particles to make toxins and other chemicals. These toxins cause great irritation to the gums, prompting them to become inflamed and bleed easily upon contact. Over time, plaque hardens into a solid build-up called calculus or tartar, which further irritates the gums and causes them to pull away from your teeth. Bad breath, pain, and discomfort can result from progressive gum disease. If you are beginning to experience the signs of gum disease, see your dentist. Milder forms of gum disease can be controlled by regular professional cleanings and consistent hygiene at home. For more severe forms of gum disease, your dentist or hygienist may recommend scaling or root planing. Scaling involves the removal of hard and soft calculus deposits from the tooth crown, while root planing removes deposits that have collected along root surfaces beneath the gums. These procedures clear deposits to reduce the inflammation, pain, and odor associated with gum disease.